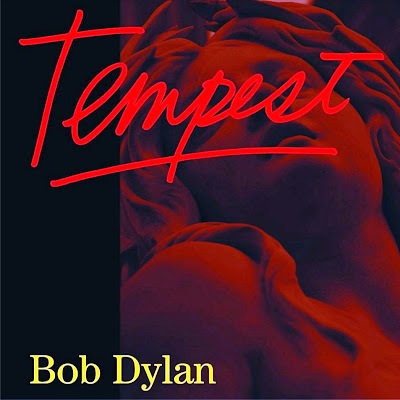 Baugh's Blog: CD Review: Bob Dylan's "Tempest"
It’s hard to care about an album for which its creator seems not to care at all. For me, this is déjà vu – a re-run of my response to the disappointing album Together Through Life (2009); but this is an even more egregious example of Dylan’s shoddy and perfunctory attitude to record production. Hey, Bob; if you can’t be bothered to give it your best shot, why bother at all? 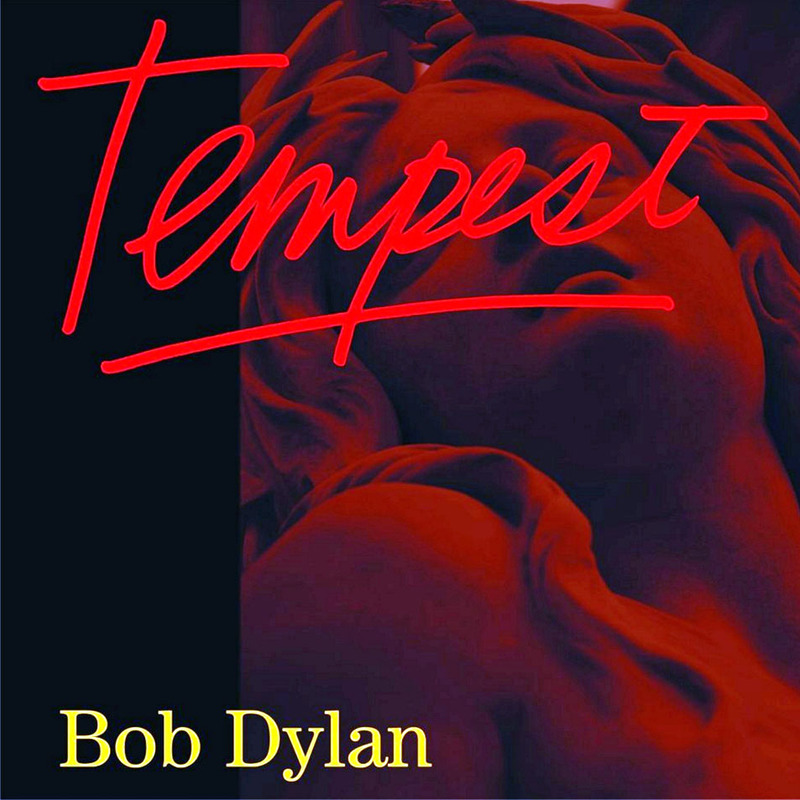 Tempest is Bob Dylan’s thirty-fifth studio album, released in the year that marks fifty years of his status as a recording artist (Bob Dylan, his debut effort, was released by Columbia Records in March 1962). 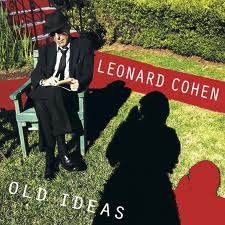 It’s great to have him still around as a creative force, as a committed songwriter. I just wish he’d do a proper job producing his albums – or get someone in willing to exert the effort required to present the songs in a dynamic and interesting way. Tempest features the core of the band that played on the last album: George Receli on drums, Tony Garnier on bass, Donnie Herron on steel guitar, banjo, violin and mandolin, and David Hidalgo (of Los Lobos) on accordion, guitar and violin. Added for this projct are guitarists Charlie Sexton and Stu Kimball. The album was produced by Jack Frost (aka Bob Dylan), engineered by Scott Litt, and recorded and mixed by Scott Litt and Dana Nielsen. This new album was released in Canada on September 11. I got it on the first day of release and have been listening to it constantly since. I liked the single that was released ahead of the album – “Duquesne Whistle” (pronounced Ducane). But my initial response to the album was not favourable. A mediocre set of songs, I thought. And the sound of the recording is dreadful. And then the reviews started coming in from the critics and pundits. Surprisingly – for me – it has been getting highly complimentary notices. Three-out-of-four stars; four-out-of-five stars. And lots of wishful thinking. But I kept listening. Maybe it would grow on me with time; maybe its dark secrets would be revealed? Nah. It’s no surprise that “Duquesne Whistle” was released as the single. It’s one of the shorter pieces; and it has an upbeat, spacious arrangement – unlike the rest of the stuff on the CD. Clearly, this track was recorded and mixed at a different time, and with a different production approach. It sounds good: starts with an old-timey western-swing introduction, and then switches into a breezy shuffle. It also features several tempo changes. An auspicious, unpretentious beginning. But then things change. From now on in, all the tracks are virtually in mono. There’s very little stereo separation. The backing behind the dominant vocals sits dead-centre, with an occasional instrument panned primarily into one channel. As if that isn’t enough, there are almost no solo instruments featured. Most “arrangements” are nothing more than an endless riff laid down in unison by four or five instrumental parts. “Narrow Way”, for example, goes on for seven-and-a-half minutes with a single riff. As music it is mind-numbingly dull. And when an interesting instrument is introduced into a track for added colour – banjo, mandolin, fiddle – it is often buried in the mix, and given no opportunities to solo. Why bother, then? Strange! “Long and Wasted Years” has an intriguing vocal performance, but the track fades in with a sloppy intro and rambles on with another boring riff. “Early Roman Kings” features David Hidalgo on accordion. The “Mannish Boy”-styled riff running through the track has no bite to it. And Hidalgo’s accordion part sounds tentative and unrealised. 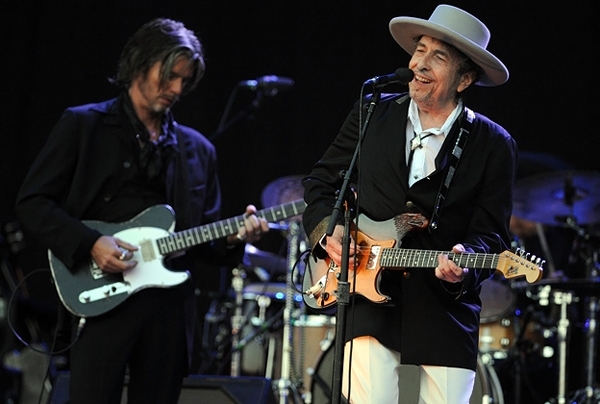 When it does sound as though a full-blooded solo was planned, we get aimless noodling instead, as though the arrangement was not clearly thought out in advance – which, given Dylan’s recording technique, would actually be no surprise. The one track that grabs my interest is “Pay in Blood”. The music here gives the performance more momentum. The lyric is dark and brooding – featuring the ominous refrain: “I pay in blood, but not my own.” “Scarlet Town” is also effective – despite the uninteresting musical arrangement. The final three tracks are very different and offer a varied coda to the album. “Tin Angel” is an atmospheric ballad, which tells a Matty Groves-styled story of a double murder/suicide. The song’s setting is strangely confusing: it starts off sounding medieval – one of the protagonists wears a helmet and carries a cross-handled sword (even though he asks his servant for “a coat and tie”). But later in the song, he cuts an electric wire and fires a hand gun. 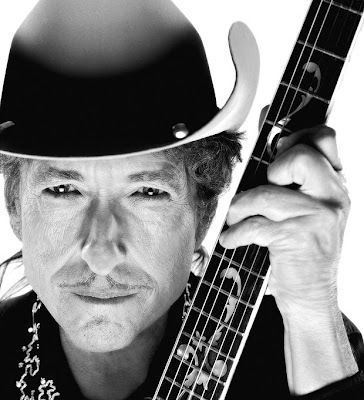 Instrumental solos between verses would add extra atmosphere to this track, but Dylan goes with drums, bass and banjo playing the same parts throughout. The title-song, “Tempest” comes next. 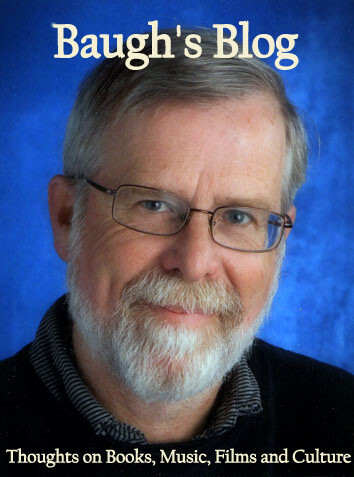 It is Dylan’s epic, 45-verse account of the Titanic disaster. One can admire the effort involved in telling the story in song, but the result is strangely unaffecting – as though Dylan is merely going through the motions, without anything significant to say, beyond the trite notion that “there is no understanding of the judgment of God’s hand.” One also wonders whether or not Dylan had a clear grasp of the time-line of the disaster. Seemingly just moments after the collision with the giant iceberg, he says that the quarterdeck was three-feet deep in water. It took much longer than that. The reference to the artist Leo seems to be an allusion to actor Leonardo Di Caprio – who plays the part of Jack Dawkins in the James Cameron version of the Titanic story. Maybe Bob just watched the movie, and didn’t bother with the book! The final track on Tempest, “Roll On John” is a tribute to John Lennon. Nice idea. I was happy to hear that Dylan would do such a thing. But the song, ultimately, is quite the downer. Its pace is dirge-like. Bob’s voice is more cracked and shattered than any other effort on the album. And, as with the Titanic song, Tempest, Dylan really doesn’t have much of interest to say about the subject of this song. Just going through the motions, it seems. Well, there it is. For me, a disappointing album. Much of the music here is monotonous. The songs often feature uninspired two-or-three note melodies. The arrangements generate no interest in the songs. There is little momentum to the album as a whole. 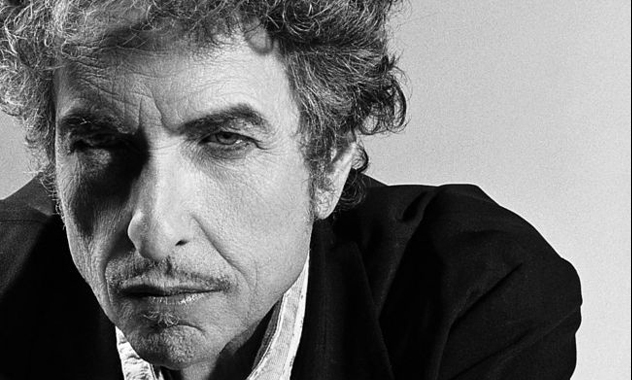 As a producer, Dylan seems to hold no belief at all in the power of instrumentation and arrangements to add significant interest to the sounds of the songs he is presenting. He doesn’t use the music to decorate the songs; he uses it in a very utilitarian way – to underpin his vocals. And pretty much nothing more. Do us a favour, Bob. Bring in a real producer. Someone who is able to make the music in an album do justice to the songs they present. Let’s give Jack Frost the cold shoulder. Like your final comment,"Give Jack Frost the cold shoulder.." ha! ha! Recently there was a Newsnight discussion about this album and they played some snippets of the music. Generally the critics, who usually comprise, Kirsty Walk the erudite presenter, Germaine Greer, quite often but not this time, a professor of something or other, a journalist of some persuasion, and a novelist from a whole range of novelists still alive!!!!!! They generally thought it was good. One comment was that Dylan had eventually found the vocal sound he has been searching all his life for. They commented on the Titanic track but not it's perhaps simple view and inaccuracies you mention. On the strength of Newsnight I was going to buy the album. BUT, not now. Good review, Clive.